I was hoping to get in a lengthy paint session tonight, but it didn't happen. 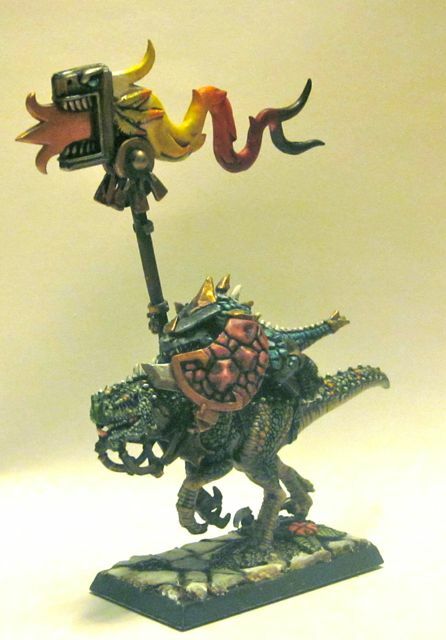 The plan was to get 5 riders done for my Saurus cavalry, and I only got the unit standard done. Snapped a couple quick pics before heading to bed. 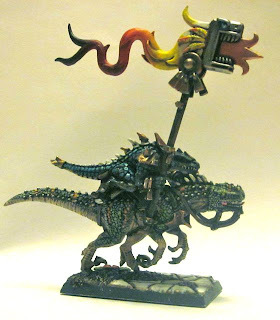 As you can see, the old metal Saurus riders fit perfectly on the Dark Elf cold ones. You just need to snip off and file down the high front and back of the saddles, which is really easy on the plastic mounts.